Chengdu is the provincial capital of Sichuan Province as well as the commercial, communications and transportation center in southwest China. It is also an important gateway to Due to the complex geological composition of the region, Chengdu is endowed with abundant natural resources, such as minerals and rare species, in surrounding areas. 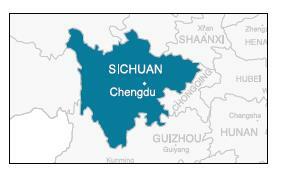 At the same time, Chengdu and the Sichuan Basin in general are susceptible to natural disasters, such as the massive Wenchuan Earthquake in 2008. Nonetheless, the city has been reconstructed quickly and is on an optimistic growth trajectory. There are expressways linking Chengdu to cities across China including Beihai, Shanghai, Xi’an, Lhasa and Chongqing. Chengdu is the largest railway hub in Southwest China, linking four trunk railways to the cities of Chongqing, Baoji, Kunming and Daxian. There are four cargo railway stations in Chengdu, of which the Chengdu Eastern Station is the largest in Southwest China. The Shuangliu International Airport has direct flights to Hong Kong, Bangkok, Singapore, Seoul, Tokyo, Fukuoka, Katmandu, Osaka, Paris, and Kuala Lumpur as well as flights to all major domestic airports. In 2008, it was the busiest airport in West China recording an annual passenger throughput of 17.25 million. Construction of the Chengdu metro began in December 2005. Five lines are set to be built in the first phase of development, covering 126km (78.75 miles) and 116 stations. Eleven of the 116 are interchanges between routes. The network is designed to cope with massive passenger demand. By 2020, it is expected to carry 13.1 million passengers every day, rising to 14.1 million a day by 2035. Chengdu is a state-designated trade and finance center as well as a communications center for the southwest. Chengdu has kept its two-digit GDP growth for twelve consecutive years. The city’s’ GDP was RMB390.1 billion in 2008, an increase of 12.1 percent from 2007. ncome of rural residents, retail sales, exports, imports and used FDI has seen the highest growth since 2001. Exports and imports increased by 58.8 and 66.7 percent respectively. Used FDI grew by a remarkable 97.3 percent. There were also 279 new foreign enterprises that came to Chengdu in 2008. A report on world cities by the Research Institute of the Chinese Academy of Social Sciences in 2006 ranked Chengdu 94th globally, 11th among all Chinese cities, and first in West China. Chengdu has six pillar industries: high-tech, manufacturing (including aviation technologies), bio-engineering and pharmaceuticals, food processing, metallurgy and building materials and petrochemical processing. The city’s manufacturing industry is driving its economy forward, with major manufacturing products such as automobiles and motorcycle spare parts, aircraft parts, engineering machinery, lathe tools, electrical engineering and electric apparatus, general spare parts and agricultural machinery. Chengdu has a strong record in attracting foreign investment, 134 of the world’s Fortune 500 have established branches, research and development centers or affiliated organizations in the city in 2009. Intel, the world’s largest chip maker, invested US$525 million in two assembly and testing facilities in the city. It also announced the closing of its Pudong factories in Shanghai in February 2009 and plans to move them to Chengdu. Other foreign companies with investments in Chengdu include Nokia, Sony, Toyota, Motorola, Microsoft, Ericsson and Lafarge. Fortune 500 companies who started investing in Chengdu in 2009 alone included Volkswagen, DHL, JPMorgan Chase, Accenture, Texas Instruments and Astellas. The city is an important base for scientific and technological research and development center. There are 110,000 students graduating from 33 universities and technical schools, 2,700 scientific and research institutions in the city every year. Chengdu has 70 institutes, 31 enterprise technical centers, six national key laboratories, 31 national centers or bases of professional key laboratories, nine national engineering (technology) research centers and enterprise technical centers. Chengdu also has over 1,000 companies engaged in application software development for specific industries as medical care, telecommunications, finance, education, transportation, insurance, administration and business management. Chengdu was one of the five cities to be named as pilot reform cities by the Chinese government. This means that decisions of policy and economic strategy for the city now reside in the hands of the local government rather than Beijing, giving the local government and businesses a far greater say in the economic development of the city. The zone consists of the southern and western zones and also includes two export processing zones. The three major industries are electronic information, bio-pharmaceuticals, and precision machinery manufacturing. The Southern Zone has planned area of 47 square kilometers while the western zone has a planned area of 35 square kilometers. There are more than 600 FIEs in the zone including Intel, Molex, Motorola, Corning and Sony. By 2007, registered enterprises in the zone reached 11,800, of which 674 were foreign firms, including 33 Fortune 500 enterprises and 848 high-tech companies. All economic indicators showed a 25 percent growth rate and ranked the zone number five out of 55 state-level high tech development zones. The industrial output value reached RMB105 billion. Income for technology, industry and trade reached RMB134.8 billion. The Chengdu Hi-tech Zone focuses on R&D and manufacturing of high-tech industrial products, especially micro-electronics-oriented IT (software included), bio-pharmaceutical industry focusing on TCM, precision mechanical processing, modern food processing, new materials and environmental protection. There is also an export processing zone (EPZ) in both the southern area and the western area.The southern EPZ covers a total area of 0.6 square kilometers and the western EPZ 2.2 square kilometers. Approved as a state-level development zone in February 2000, the zone now has a developed area of 10.25 square kilometers. The CETDZ lies 13.6 kilometers east of Chengdu and is the transportation and communication hub of Southwest China. CETDZ is 28 kilometers away from Chengd Shuangliu International Airport, one of the country's four major airports. Chengdu-Chongqing Expressway is to its north, and the Chengdu-Kunming Railway to the west. The Cheng-Long Highway, the City-ring Expresswayand Chenghuan Highway run through the zone. One can directly reach Chongqing Jiulong Harbor and Luzhou International Freight Dock by the Chengdu-Chongqing Expressway. CETDZ focuses on machinery, electronics, metallurgy, building materials, medicine and food processing. The National Electronic Devices Industrial Park, with a planned area of 40 square kilometers has already attracted over 200 projects from more than 20 countries. Investment is encouraged in the following: machinery, automobile, motorcycles, electronics, optical products, informational technology, new materials, environmental protection, biomedicine, food processing, new building materials, refined chemistry, aviation and space industry and infrastructure building.